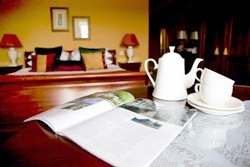 Hotels in Westport | Accommodation Westport | Ardmore Country House Hotel & Restaurant, Westport. Ardmore Country House is a small luxury four star country house in Westport Co. Mayo located in a peaceful seaside setting just minutes from Westport's vibrant town centre. Tucked away in its own coastal garden, Ardmore is a haven away from the hustle and bustle yet is within a short stroll of the historic 18th century Westport harbour, with its scenic walks, cafes, shops and traditional bars. 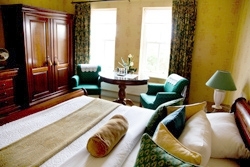 Owned and operated by the Hoban family, the Ardmore Country House has a well established tradition of genuine hospitality with an emphasis luxury accommodation. Westport is located at the foot of Croagh Patrick and close to many blue flag beaches for energising walks, swimming or surfing. The sea angling grounds of Clew Bay are recognised as being some of the best in Europe and Westport's 18 hole championship golf course draws many visitors. We would be happy to make a golf reservation for guests or arrange horse riding on one of our local beaches or fishing with a local gillie...endless opportunities to enjoy the country and seaside surroundings! A warm reception awaits you at Ardmore Country House - an oasis of tranquility located on the edge of Clew Bay. Ardmore Country House can also be rented on an exclusive basis, inclusive of full staff and meals. We are the perfect venue for family vacations, a private house party, birthdays, reunions, anniversaries, christenings, small corporate events or any other occasion you are planning which would suit a peaceful, exclusive fully serviced venue. With 12 double rooms and one twin, all with en-suite, we offer sleeping accommodation for up to 26 people. Please contact us and we will be happy to discuss. Ardmore Country House can be rented on an exclusive basis, inclusive of full staff and meals. Please contact us and we will be happy to discuss.